The Ballard House was built by Judge Marcus Lane in 1832. Before completion, it was acquired by Arden H. Ballard, and has ever since been known as the Ballard House. It was built by James Forsyth from his own drawings. The house was owned successively by Isaac Newton Conklin; Mrs, Helen Swift; Dr. James Heustis. 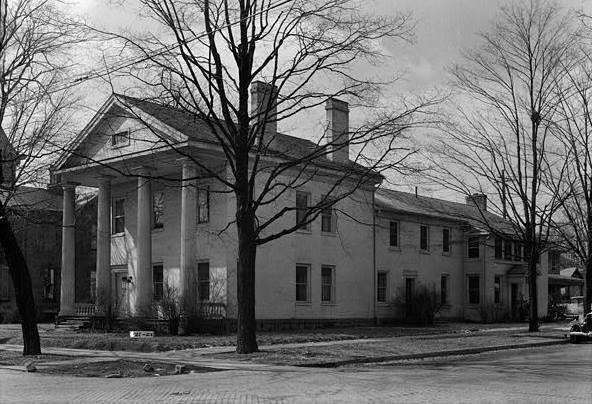 In 1936 the owners were Dr. and Mrs. James B. Breakey, who also own the Breakey House at 1885 Packard road, near Ypsilanti, another very fine example of the Greek Revival Period. The original wing is 32' x about 50'; second wing was built in 1842, and the third wing by present owners in 1925. 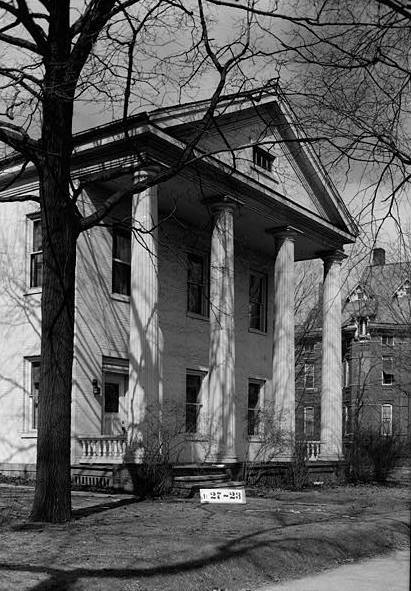 Original wing, two story, with attic and basement of brick painted white; four column portico under pediment, facing East. Two large brick chimneys. Entrance has two smaller columns flanking door. Typical interior trim pine painted white. Stairway balustrade of solid walnut, the starting newel being surmounted by a spiral center with a deep inlay of mother of pearl on top.